Bone Horses is a novel about history lost and found, and the real and imagined stories that bind one generation to the next. A Southwestern mystery that incorporates archaeology, Leslie Poling Kempes’ first novel takes readers on a hunt they are sure to remember. New York school teacher Charlotte Lambert is practical and predictable, and never allows life to veer off course. Until she comes to New Mexico. During one summer in Agua Dulce, a village haunted by a phantom herd of wild horses and where ravens embody the spirits of ancestors, Charlotte’s world is upended as she unearths the details of her mother’s forbidden love affair, chilling murder, and courageous last act of redemption. Pursued by a madman hell-bent on killing her, Charlotte finds shelter, romance, and her own misplaced soul at the desert camp of a surprisingly sophisticated cowboy, and learns how love in its myriad forms is the only path to lasting salvation. “…an exquisitely beautiful and haunting read, which tells a moving story of love, murder, and redemption. "Bone Horses" is a novel of large ambitions and sweep, with vivid characters and big American themes, written in crisp, sculptured prose. I highly recommend "Bone Horses" for anyone who loves the landscapes and people of New Mexico.”--Douglas Preston, New York Times #1 Bestselling author of "Two Graves" and "The Monster of Florence"
“BONE HORSES unfolds like a desert sunrise—lifting from the Southwest landscape with a well-crafted storyline that keeps the reader on the path tracking romance, family legends, unsolved murders, buried bones, and elusive wild horses. I found myself drawn into the colorful and mysterious world of Agua Dulce much like I’m drawn into the vibrant and deceptively simple landscape of a Georgia O’Keeffe painting. And, like BONE HORSES’ heroine Charlotte, I found myself not wanting to leave.”--Page Lambert, "In Search of Kinship"
Lesley Poling-Kempes was born in upstate New York, and spent her childhood in Buffalo and Pleasantville, New York, and in Bartlesville, Oklahoma. Family vacations to Ghost Ranch in the 1960s introduced Lesley to the place that would become her permanent home: Abiquiu, New Mexico. Lesley attended the College of Wooster and the University of New Mexico, and earned degrees in journalism and film. She worked as an editorial intern at New Mexico Magazine after graduation from UNM, but declined a permanent staff position so that she could pursue her own muse. 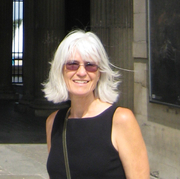 Since 1977, Lesley has worked as a writer and author of both fiction and non-fiction works. With her husband, Jim Kempes, a teacher and sculptor, Lesley built a solar adobe home on the high desert near Abiquiu. Lesley and Jim have two children, Christopher and Marianne. Lesley Poling-Kempes is a LibraryThing Author, an author who lists their personal library on LibraryThing. Lesley Poling-Kempes is currently considered a "single author." If one or more works are by a distinct, homonymous authors, go ahead and split the author. Lesley Poling-Kempes is composed of 2 names. You can examine and separate out names.